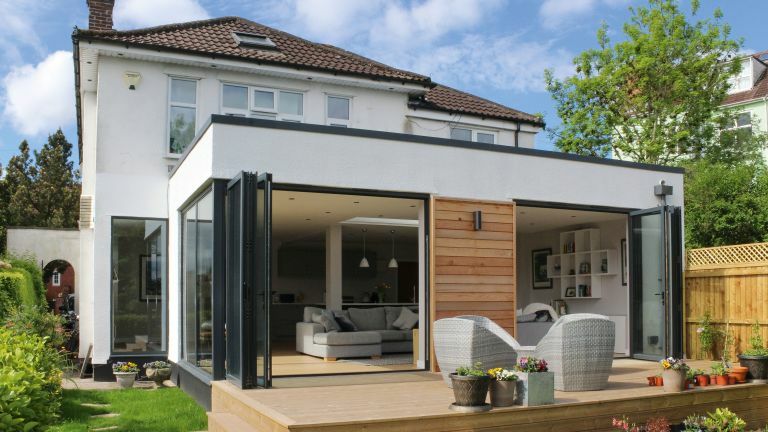 Building a single storey extension is the perfect way to create extra living space in your home, and might allow you to expand an existing small kitchen into a kitchen dining and living space. It might also give you the extra space to add a utility room, a cloakroom or boot room. In other words, a single storey extension will allow you to transform the downstairs of your home to better suit your lifestyle. Building a single storey extension is also the perfect opportunity to get more natural light into interiors with the addition of rooflights and much sought after bi-fold doors. They are a good alternative to moving house, too – just think of the savings you'll make in fees like moving van hire and stamp duty alone. But how to plan and design a single storey extension? And what does a single storey extension cost? Follow our three-page expert, step-by-step guide to getting the planning, design and budgeting of your extension right first time. On this page, we discuss the cost of a single storey extension; on the next page, extension planning and on page three, designing a single storey extension. What is the cost of a single storey extension? There are different ways to break down the cost of a single storey extension, but here are some rough costs. Building work costs depend on the results you're after, but reckon to pay around £1,500 to £1,900 per square metre for basic quality; £1,900 to £2,200 per square metre for good quality; and £2,200 to £2,400 per square metre for excellent quality. For an average single storey extension of 4m x 5m, the build cost would therefore be £30,000 upwards for basic quality; from £38,000 for good quality; and from £44,000 for excellent quality. Remember, this is without interior fit out costs, and professional fees (see more on this below), which come in at around 10 to 15 per cent, and VAT at 20 per cent. With these added, the lowest build cost for a 4m x 5m single storey extension would be just shy of £40,000, with the upper end nearer £58,000. Don't forget too, that in certain parts of the country, such as London, costs will be significantly higher. For an accurate estimate of how much your single storey extension will cost, use our extension cost calculator. Bear in mind too that the cost of a single storey extension tends to be lower than that of a double storey extension because it will need less substantial foundations and steelworks. However, two storey extensions are more cost-effective per square metre, so consider your options carefully. What is the cost of a single storey extension interior fit-out? For a kitchen, budget from around £5,000 to £20,000, depending on the specification; if you go high end, costs can increase significantly on this. For a utility room, factor in from around £1,500 to £11,000, according to its size and the level of fittings. For flooring, budget in the region of £25 to £100 per square metre. For wall and ceiling finishes not included in the build costs, set aside from around £85 per square metre for plaster or dry-lining plus paint. Bi-fold or sliding doors cost from £1,500 to £2,000 per linear metre. These are a great way to bring in light and connect your home to the garden – and also create the feeling of even more space. Extending an existing central heating system for a single storey extension might mean no more than two to three days' work by a plumber, at around £150 per day excluding materials. Underfloor heating costs vary: electric underfloor heating is cheaper to install but more expensive to run than water-fed. Find out more in our guide. A new boiler may be needed to meet the demand of water-fed underfloor heating; the Energy Saving Trust estimates the cost of a gas boiler replacement at around £2,300. Budget for architect design fees from three to seven per cent of the construction cost. That puts the fee for an extension of £30,000 at £900 to £2,100, for example. There's a minimum cost of around £2,700 to £4,000 for planning drawings and also for construction drawings. If you need a structural engineer to size roof joists and foundations, factor in £500 to £1,000. A measured survey of the existing house will cost from £500 to £1,500 depending on the size of the property. If you are employing your designer to put the contract out to tender, appoint the builder and administer the contract, budget for a further three to seven per cent of the build cost (again, around £900 to £2,100). Alternatively, agree a day or hourly rate for ad hoc site attendance. Project management by a building contractor or architect will be 15 to 20 per cent (up to £4,500) on top of the net cost of labour, materials and overheads, although you can save money if you manage your own project. VAT at 20 per cent of the labour, materials and services will add to your costs. If your individual sub-contractors turn over less than the VAT threshold, they won’t charge you any VAT on labour. That could mean that an extension of 4m x 5m at a build cost of £30,000 could potentially attract professional fees upwards of £12,000. The planning fee for a residential single storey extension in England is £206. A certificate of lawful development will cost you £103 and the fee for discharging planning conditions is £34 per request. Make sure you have gone through your plans thoroughly with an architect or builder who is familiar with the local planning authority and their preferences. Find out how to make a planning application with our easy guide. Historic building report, likely if your home is listed. The size of your single storey extension will affect the fees for building regulations approval. Plan for from £200 for one to 10 square metres, and £900 for 80 to 100 square metres, whether you go for a full plans application with everything approved before you start, or a building notice application, where you need only give 48 hours’ notice of commencement. ‘If your neighbours consent formally to your single storey extension project, you won’t need a party wall settlement and can save money here. If not, having a surveyor arrange party wall agreements for you typically costs from £700 to £1,000 per neighbour,’ says renovations expert Michael Holmes. All in all, it's worth setting aside at the very least £2,000 to cover any expected and unforeseen fees for permissions and sign off – or at least making room for these fees within your single storey extension contingency fund. This will give you a minimum spend of £45,000 for a single storey extension of 4m x 5m of basic quality, including most fees, but excluding interior fit-out costs which have too many variables to factor in here.